This is a copy of all the posts and comments from the old GameslingerEnterprises.com blog. New content now appears on the main blog. Back in early June, Ted, Christina, Roy, and I sat down to figure out what we wanted to play next. The concept that grabbed us was the idea of a Delta Green cell, inactive since late 2001, that realized they needed to "get the band back together." The game is set in Houston in 2006, and while the original idea was to play it with the Unknown Armies mechanics, we quickly realized that there wasn't a published system that quite did what we wanted. So, after two sessions of what we termed "hippie freeform play," I sat down to design something that would work for us. Last night I handed out what I consider the first "real" version of The Game With No Name. We'd played three sessions with a prior incarnation, but all that had was a character sheet and something theoretically connected components. (Due to the last few months being summer, we'd only gotten in five sessions of play in June, July, and August. ) The current version actually hooks things together with feedback loops, which for my money is what makes a real game. We didn't have much of a chance to use it, as our session was short due to Roy's recent return from Greek and subsequent jet-lag, but I think it will work out. In brief, it's a mashup of Otherkind dice with Burning Wheel-style Beliefs and Unknown Armies' Madness Meters. Last night Ted pointed out that it should have some type of cell resource system, a la Conspiracy X, so I guess I have another source to pillage before next week. I almost didn't make it back from GenCon on Monday night, but thanks to the foresight of an American Airlines gate agent and my willingness to run through LAX, I did. My GenCon is only tangentially about gaming. I played more games in the two days I spent at Ken and Sheila's place than I did during all of GenCon. For me, it's all about the people. I reconnected with old friends, met new ones, and missed people who weren't there. A sense of impending loss haunted me every morning in Indianapolis, as I couldn't stop thinking there were only a few days left until I lost the opportunity to see these great people for another year. But as soon as I ran into someone on my way to the show floor, I was caught up in the excitement. If you're someone I talked to at GenCon, thank you for making it an amazing show for me. Having people tell you that your game is fun is tremendously fulfilling. Yes, I sold through the all of the copies of A Penny For My Thoughts that I had with me (which exhausts the first print run, by the way). And yes, that felt good, in both wallet- and ego-related ways. But the experience of having multiple people come up to me and say, "We played Penny last night, and it was awesome, and we had fun!" blew my mind. If nothing else comes of Penny, it's been a success for me. So that was the essence of GenCon for me. And now it's forward into the New Gamer Year. My friend and editor Ryan Macklin has posted about his experience developing A Penny For My Thoughts. I've been incredible thankful for everything Ryan has said about the book so far, and this post is no exception. 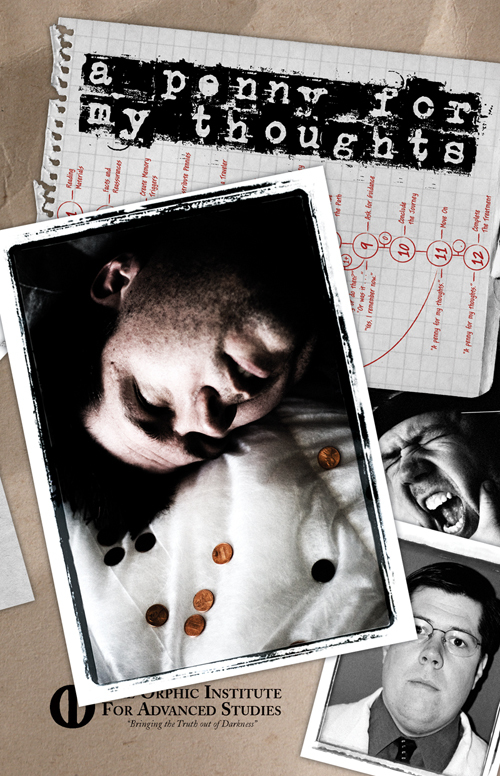 A Penny For My Thoughts, my story-telling game of improvisation and identity, is in the warehouse and shipping now. Order by the end of June to get the print + PDF bundle for only one penny more than the book's cover price. Have you lost your memory? The Orphic Institute for Advanced Studies can help, with its revolutionary Mnemosyne™ treatment process. By ordering this useful treatment guide, you can learn how to get your memory—and your life—back. Order today. The Orphic Institute for Advanced Studies: Bringing the Truth out of Darkness™. For a limited time, you can preorder this instructional book together with the PDF for only one penny more than the book's cover price. Take back your memory today with A Penny For My Thoughts.